(Seychelles News Agency) - Imagine spending the evening relaxing on a padded couch, watching a film and sipping on a glass of champagne, then after a sumptuous meal you decide to retire to your comfortable bed, snuggling up into a luxurious duvet. But you are not in your own home, and neither are you in a hotel. 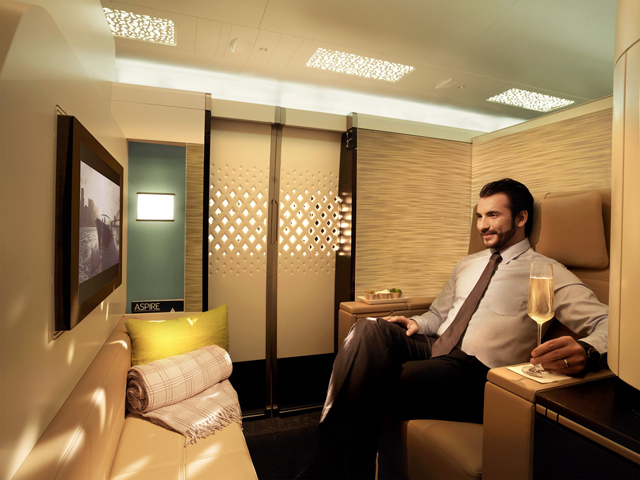 You are 10,000 feet in the air on your way to London, aboard an Etihad Airways Airbus A380. This scenario is Etihad’s latest first-class concept, called First Apartments, which last week won the Overall Design Award 2014 at the Society of British and International Design (SBID) Awards, held at the Dorchester Hotel in London. According to a press statement issued today by the Abu Dhabi-based airline, the annual event is considered to be one of the most prestigious among the world’s design fraternity, and was picked up by London-based Acumen Design Associates, which forms part of the ‘Etihad Design Consortium’ (EDC), a collection of leading brand and design agencies tasked with creating the airline's new interiors. The CEO of Acumen Design Associates, Ian Dryburgh, said the firm was briefed to design a first class cabin based on Etihad’s concept of ‘Inspired Service’ to “bring the individuality and exclusivity of a luxury boutique hotel experience” to the Etihad first class guest. The airline will be installing nine First Apartments on each of its ten new Airbus A380s, the first of which will enter service between Abu Dhabi and London Heathrow on December 27. On the new wide-body aircraft the upper-deck First Class section will offer private walk-in living areas which include a Poltrona Frau armchair and separate 80.5 inch bed, storage, a full length wardrobe, chilled mini-bar and a vanity unit. At 39 square feet, the First Apartment boasts a stunning 74 percent larger area than Etihad’s current First Class suites. The Chief Commercial Officer of Etihad Airways, Peter Baumgartner, expressed his happiness that Acumen’s work had been recognised by the SBID. 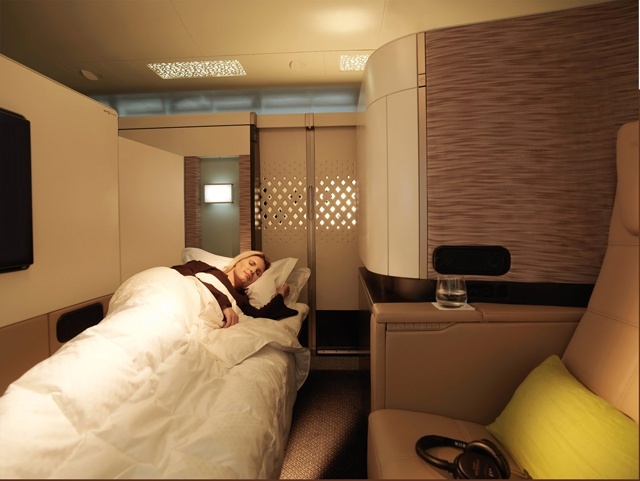 “This accolade is testament to their world class service, from the initial concept designs based on our extensive international customer co-creation workshops, The Etihad Big Talks, to the final delivery of this elegant cabin,” he said. Etihad Airways began operations in 2003 from its Abu Dhabi base, and last year carried 11.5 million passengers to 111 passenger and cargo destinations in the Middle East, Africa, Europe, Asia, Australia and the Americas. Etihad Airways holds equity investments in airberlin, Air Seychelles, Virgin Australia, Aer Lingus, Air Serbia and Jet Airways, and is in the process of formalising equity investments in Alitalia and Swiss-based Etihad Regional. Etihad bought a 40% share in Air Seychelles in 2012 with an investment of $45 million, and the airline has delivered consistently positive results since, most recently announcing a 20 percent increase in its revenue for the first half of 2014 compared to the same period in 2013.